If you read yesterday's post, you'll see I've been traveling all week. Needless to say, I was exhausted last night. We never really celebrate Valentine's Day at all, so I truly wasn't expecting anything. I was at home already by the time he had gotten home from work, and he tells me to turn around while he goes to get my gift. I was a bit baffled. He walked in with a ginormous box. It was too big to be a shoe box! But knowing it was from Nordstrom, I knew there was no way he did this on his own. Sure enough, I opened this box to find another box. A shoe sized box. 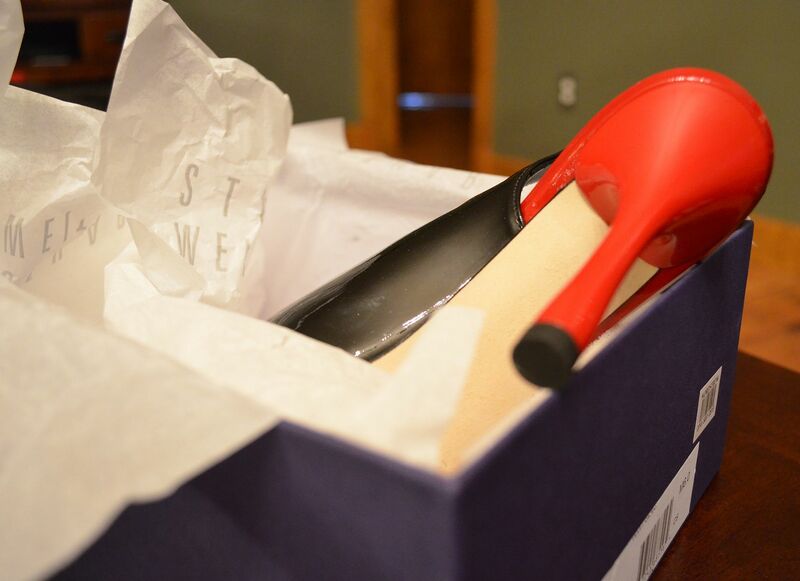 So, I will admit, that when I first saw the peep toe, I thought of these Loubies on my wish list! But, obviously, this was a Stuart Weitzman box, which still equals super happy! Ok back to the reveal.